“I've lived here my whole life,” he said. “I graduated with a high school diploma in 1984 then did two years of welding at vocational school. After that, I dabbled in construction for several years. Eventually, I ended up at International Wire. I worked there for 20 years before I got the superintendent's job in 2007. My predecessor had just announced that he was going to retire. Nobody in the barn wanted the job, so I threw my hat in the ring. I've always been active in the community. I've been in the fire department for over 30 years — past chief, present chief. I was involved in Little League, VFW… so everybody knew me. Winning the election was bittersweet. “He had a hobby of flying ultralight planes,” Mike said of his predecessor. “Unfortunately, he died in one in October of 2007. The board contacted me and asked if I could start before January 1st. I started after the general election in November. It started as a two-year term. Now it's four. I'm up for reelection in 2022. “We were good friends. Being the fire chief, I worked closely with him over the years. There was never any animosity between us. When he was going to retire, he told me I'd be a good fit for the job. He supported me right up until he looked at his retirement and saw he needed a few more years to pad his pension. When it comes to facilities, Mike has one main highway barn that was built in the 1950s. So, what was the real story behind wanting to become highway superintendent? “I'd been in the fire department for a long time,” Mike said. “I was sick and tired of having to chase after accidents because the roads weren't being plowed well enough or often enough. We were getting called out in the middle of the night every time a tree fell because the highway superintendent wouldn't bring his guys in to clear the roads. I felt as a volunteer fireman having to go to accidents and trees blocking the roadways, there needed to be a better relationship with the highway superintendent and the two fire departments that serve the town. I met with the departments and told them I wanted to make the roads safer. and assist during wind storms with cleanup and not rely on volunteers to do the highway department's job. Mike has two daughters. Cassandra, 32, is married to James Bremm, who is a seasonal worker for the department and she works for a payroll company. They have three children: Wyatt, 9; Elliott, 6; and Charlotte, 1. Mike's daughter Melissa, 29, works for a trucking company as an office executive. Mike is past president of the Oswego County Association of Town Highway Superintendents, the Town Highway Superintendents Association, the State Highway Superintendents Association and a member of the NYS Rural Water Association. In his “free” time, Mike loves spending his summers in his camper. How much longer would Mike like to stay on the job? “It's small, about 150 x 40 and there are six truck bays. I have one large cold storage barn that also was built in the 1950s. My office is in the break room because there never was a separate office built in the facility back then. It was the only room that wasn't used for storage. It has a folding table for a break table. My desk for the office. “Our salt shed is a little newer than the barn. It was built in the early 1990s. It holds about 200 tons of salt and 200 tons of mixed material. We still run a salt and sand mixture. I put up about 600 loads of sand — or 1,200 tons — every winter. I use anywhere between 700 to 1,000 tons of salt to mix with it. Mike also works well with the neighboring towns. 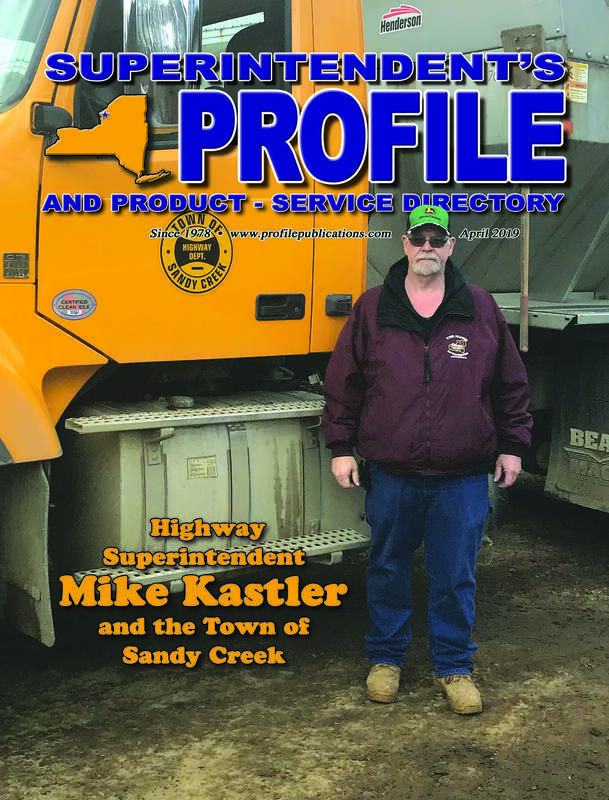 As superintendent, it's Mike's job to maintain the town's 46.5 square lane miles of road; two miles of which are gravel and the rest are paved, mix paved of CHIP sealed. All of that translates into four plowing routes that take about four hours to complete. “We also have 20 miles we contract for the winter for the county for snow removal,” he said. Mike depends on his crew of six full-time employees to serve the town's 3,817 residents. His staff includes deputy superintendent Michael Haverlock, Tim Crast, Edward Rotach, Mike Boland, Wade Brown and MP Haverlock, all of whom are machine equipment operators/mechanics. The department also employs water operator Eric Pappa and four part-time workers for the winter season. 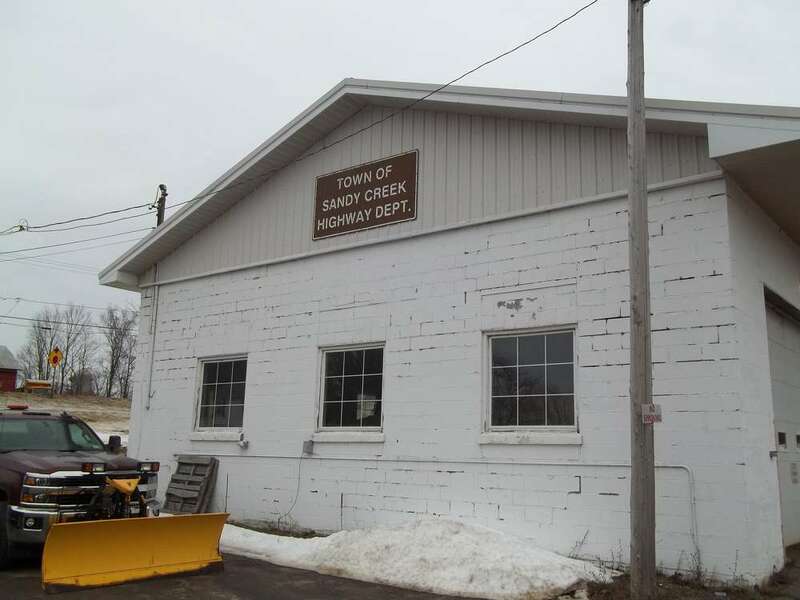 Under Mike's watchful eye, the town of Sandy Creek's highway department functions on a total operating budget of $613,000 that includes salaries and benefits for employees and an annual CHIPS allocation of $130,000. The town also receives $20,000 to $25,000 from PAVE-NY and between $12,000 to $14,000 in Winter Recovery. The town purchased a double-drum roller and Broce broom with four neighboring towns to help save money. It also is getting ready to order a new plow/dump truck for the 2019 winter. Mike is proud to say, “We own all our equipment and currently have a debt of $40,000 owed on the 2018 Mack. Our future needs include replacing our wheeled excavator. It's one of the biggest and most expensive pieces of equipment. Price is near $250,000. My dream would be to buy a paver. I would purchase that with my four neighboring townships. We'd buy a used one that would be between $150,000 and $160,000. Now, 12 years into the job, what has disappointed Mike the most? Mike admitted, however, he isn't averse to purchasing a used piece of equipment. Looking to the future, Mike sees a new salt shed and highway garage. “If we expand on the barn, I'll have to use the salt shed for two more truck bays and build a new shed. It's the lesser of the two evils. It's cheaper than building a new barn. My big goal is to see a new highway facility before I retire. We have enough space where we are. We have a fairly large area. I could put the salt shed not far from where it is now and then turn the existing salt shed into two truck bays so I have more room. My barn is so tight that we have to open and close overhead doors to get from one end to the other when the plows are on the truck. What has pleased him the most about the job? The first settlers came to what is today the town of Sandy Creek in 1803. By March 1825, the town was incorporated and from that time on interested people began to document and save records of its history. After a series of devastating fires, the Lacona and Sandy Creek village fire departments were formed. The town's first historian was Nanette Hamer who was appointed in the 1920s, probably before 1925 since that was the first documented artifact listed in the history collection. About 1927, the original copy of the 1845 census was found in a home and from that the names were taken and put into the newspaper asking for information on those families. The series was called “Sketches.” Much of the genealogy the town has today began with this Sketches newspaper article. Each historian since has put their efforts toward a different area of historic preservation. The Lacona Depot was the hub of village activity for more than a century. The Rome, Watertown and Ogdensburg (RWO) Rail line was completed through East Sandy Creek (Lacona) in the spring of 1851. The depot opened in November 1872. In 1891, the New York Central & Hudson River Railroad purchased the RWO and replaced the original depot. One of the factors that materially contributed to the prosperity of the town was the entrance of the RWO Rail line through Lacona Village. With better facilities in transportation, new enterprises were encouraged and industries were introduced. The area's two largest industries, Blount Lumber Company and Corse Press, utilized the train station for their products as did local farmers and both post offices. Salisbury House served as a temporary home for many of the towns' early settlers and the first town meetings were held there in 1825. This temperance house was the outgrowth of the inn “part frame, part log” kept by James Hinman as early as 1812, when there were only two or three frame houses in what is now Sandy Creek Village. By 1820, it is known that Nathan Salisbury had already established his inn on this site. It burned in 1884. A tannery was one of the oldest industrial sites in the village (1826) and later became the site of the Sandy Creek Wood Manufacturing Company. The precursor to today's paper plates were made there and furnished employment to a large number of men. It was located behind the Salisbury House. In 2003, the town held a yearlong celebration to commemorate the 200th anniversary of the first settlers coming to what is today the town of Sandy Creek — every month, the town had a different event or speaker. On May 31, 2008, the town remembered and dedicated the burial place of two Revolutionary Soldiers, Stephen Lindsey and Jonathan Thrasher at Pioneer/Goodenough District Cemetery on Henderson Road. The Continental Arms Collectors Association's Revolutionary War Interpretive Unit, headed by George Clark, reflects a company from the 1st NY Regiment, Continental Army circa 1782. They use 1779 Regulations for the Order and Discipline of the Troops of the United States and they offer a firsthand glimpse of the nation's colorful military history. The Continental Arms Collectors Association Inc. was founded in 1982 as a Not-for-Profit educational organization. Their mission: “to enhance public knowledge on the significance of firearms in American History.” The Revolutionary War Interpretive Unit was introduced in 1992 to further educate the public about daily life in the Continental Army. Extensive research culminated in the selection of accurate reproduction weapons, accoutrements, equipment, headgear, footwear, and clothing in use by the unit. The high standard for the group's accurate performance of military drills and ceremonies, in use by the Continental Army during the latter part of the War of Independence, is a result of the intense training the unit is committed to.